9 sessions – Based on my work in education, business, and human development, I was able to create a set of exercises to help my students realize their highest values and set their goals accordingly. I share those exercises with you in this module. The power of Values is extraordinary. The people I’ve worked with have used this approach to build businesses, find their life partners, recover from chronic pain and illness, repair relationships with spouses, parents, and children, and reconnect to their deepest spiritual callings. These exercises embody the methods I have used to create and sustain my own extraordinary life. 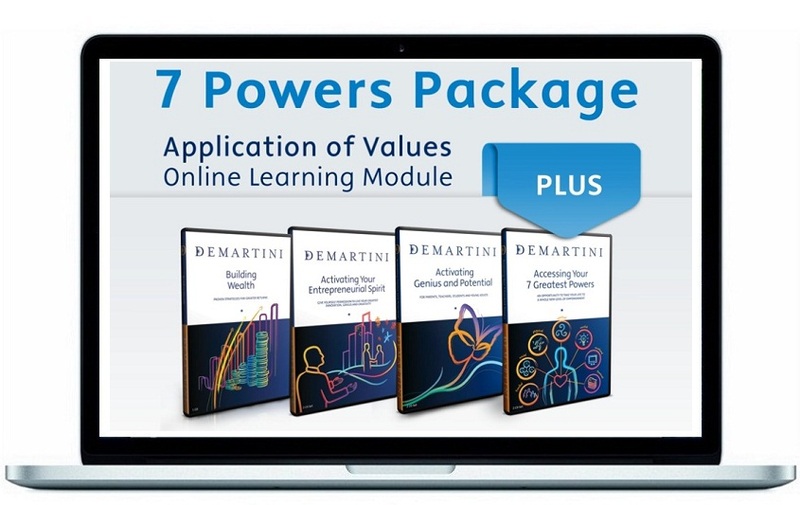 A 9 part series with Dr Demartini focusing on each of the 7 areas of life (mental development, business empowerment, financial empowerment, physical health and well-being, social leadership and influence, familial relationships, and spiritual empowerment) and what you can do to empower all 7 areas using the application of values to do so. 2 sessions – Goal Setting, Creating Vision Boards, Setting Affirmations. 2 sessions – The most powerful life-solutions seminar on the planet! Created by Dr John Demartini, the Breakthrough Experience is the culmination of 43 years of interdisciplinary study where you will be introduced to two powerful processes, the Demartini Method and the Demartini Value Determination Process. Their practical applications solve issues, balance emotions and expand your life fulfilment and potential. The Breakthrough Experience will provide you with powerful solutions to help you resolve fear, depression, resentment, anger, intimidation, low self-esteem, guilt, grief or anxiety and any emotion you’d love to have stop ‘running’ your life. You will learn how to solve challenges, build relationships, clarify your purpose, achieve your goals and so much more in just two days.